Sale Details: Limit 2 per customer at discounted price. $25.99 for each additional. Boardwalk Center-Pull Paper Towels, 7 7/8" x 10", 2-Ply, White, 600 Sheets/Roll, 6 Rolls/Carton - These Center-Pull Hand Towels manufactured by Boardwalk are the perfect choice for your workplace. Absorbent, economical and eco-friendly, these two-ply white hand towels contain 55% post-consumer recycled content, 10% mil broke and 35% pre-consumer waste fiber, meeting EPA guidelines. Boardwalk two-ply perforated hand towels are strong and sturdy enough for use in any office, work shop or garage. 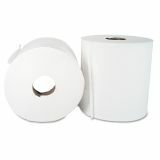 Each roll contains 600 7-7/8” x 10" sheets with 6 rolls per case. Experience 2-ply absorbency at a reasonable price. Stock up on Boardwalk Center-Pull Hand Towels and save today! 600 Sheets/ Roll. 6 Rolls/ Carton. 7.88" x 10" Sheet Size.